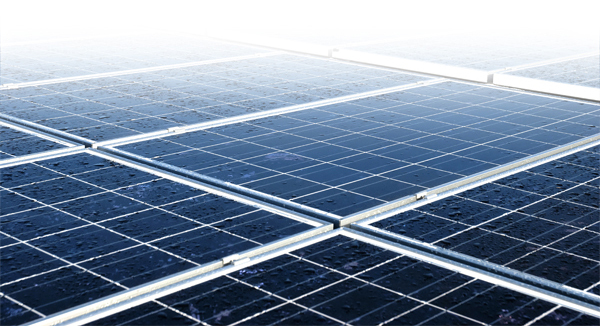 The concept of combining photovoltaic arrays with standing seam metal roofing is growing – and for good reasons. A standing seam metal roof has a life expectancy consistant with that of framed PV modules. A 30-year power source on a 40-year roof, along with zero-penetration technology, creates the most sustainable roof system available with alternative energy power generation, all without compromising the roof manufacturer’s warranty! Fit the majority of metal roofs on the market – including exposed-fastened and corrugated! Previously, electrical continuity between modules (called “bonding” within the industry) required the mounting of an electrical lug to each PV module, and interconnection of the lugs with a copper wire. However, the S-5-PV Kit’s groundbreaking NEW stainless steel mounting disk has twelve nodes designed to ensure the module-to-module conductivity of anodized aluminum module frames. S-5!’s new EdgeGrab™ is specifically designed to be used in conjunction with our patented S-5-PV Kit for solar array end conditions. 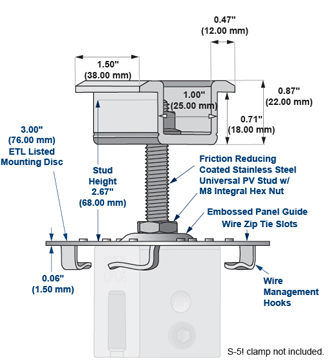 New longer PV stud now accommodates PV frame thickness from 1.3″ (33mm) to 2.5″ (84mm)! 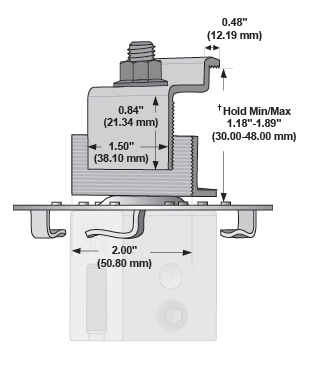 Beveled mounting disk now provides an eve easier to use module placement guide!